The Tucson resident fears she would be among the 22 million Americans, and as many as 400,000 Arizonans, who would lose health care under a bill the Senate is considering to replace the Affordable Care Act. For Klinkhamer, who said she suffers from 16 chronic conditions, losing her coverage would be a death sentence. 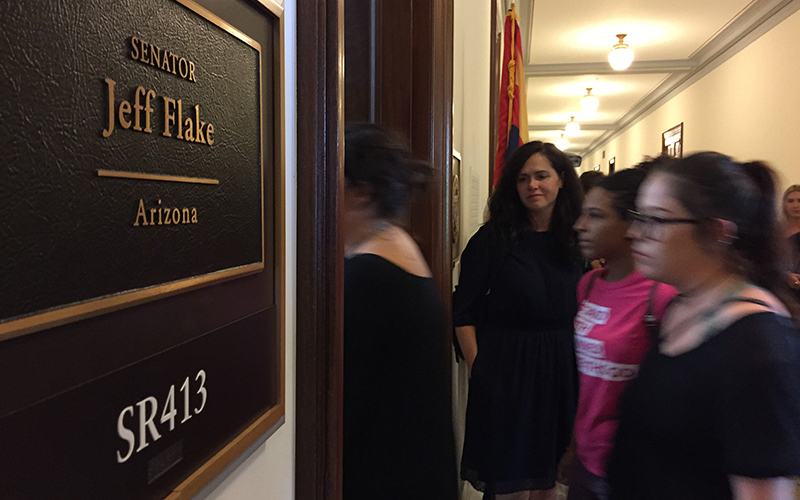 Klinkhamer was one of about 150 protesters – 18 from Arizona – who turned out at congressional offices Monday, sharing their medical stories and risking arrest in an effort to sway certain members of Congress, including Flake. The Arizona Republican, who was on a flight back to Washington during the protest, has been the focus protests at his Washington and Phoenix offices in recent weeks, targeted as one of a handful of Republicans up for re-election next year. In that statement last week, Flake thanked protesters who descended on his Phoenix office for sharing their stories. 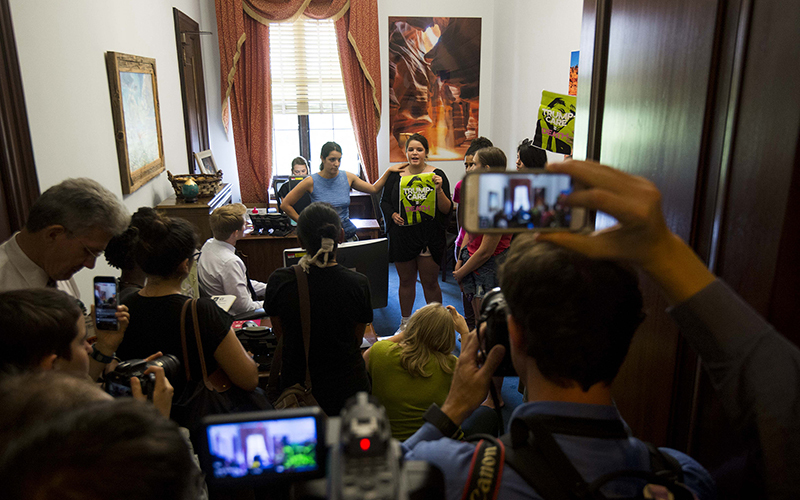 It was much the same in his Washington office Monday, where a staff member appeared to listen as protesters like Klinkhamer spoke, while other protesters and reporters packed the office. 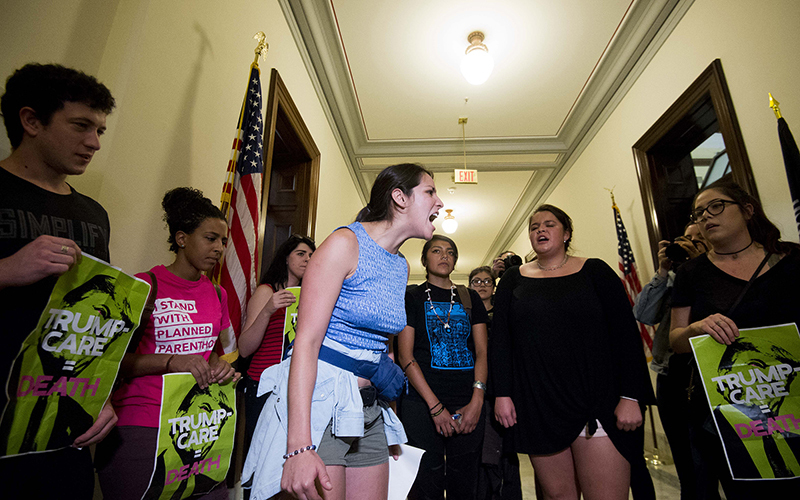 The Arizona group was part of a larger protest organized by the Center for Popular Democracy, which said 150 protesters fanned out to 15 House and Senate offices Monday. The Arizona protesters, organized by Living United for Change in Arizona, showed up at Flake’s office around 2 p.m. 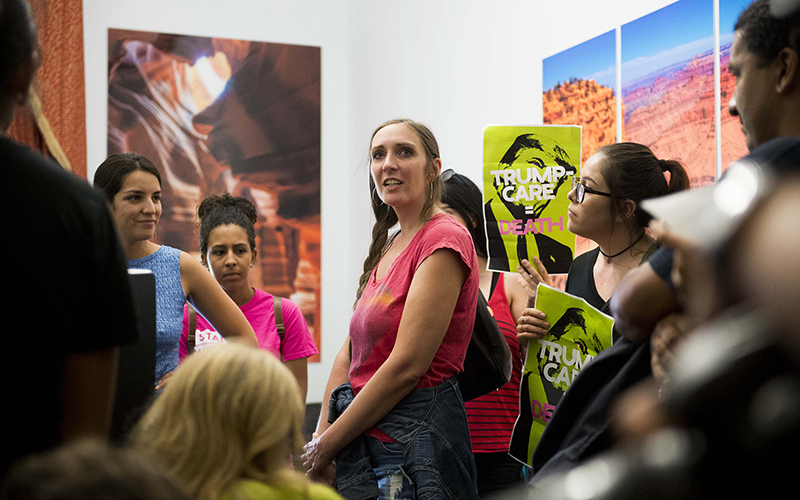 They spent 20 minutes in the office, holding neon green signs reading “Trumpcare = Death” as members took turns sharing their stories while others chanted. The protest then moved into the hallway of the Russell Senate Office Building, where about 10 sat down and started chanting. 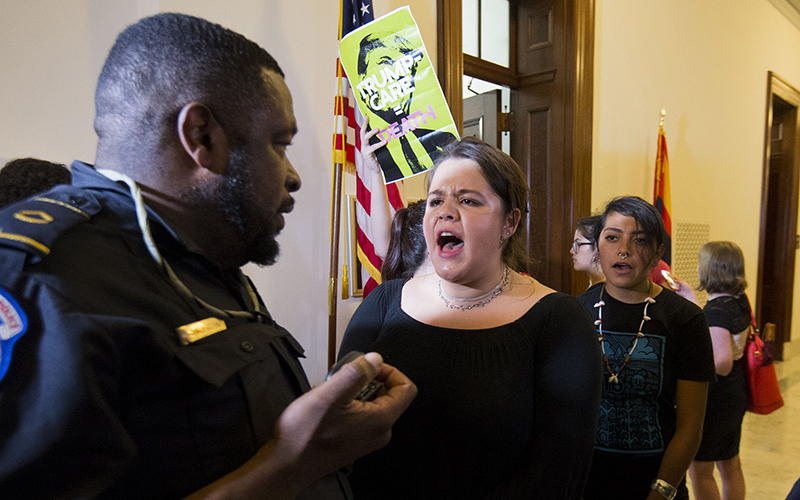 Their calls bounced off the marble halls and mingled with chants from another group of protesters shouting “shame” outside the office of Sen. Ted Cruz, R-Texas. 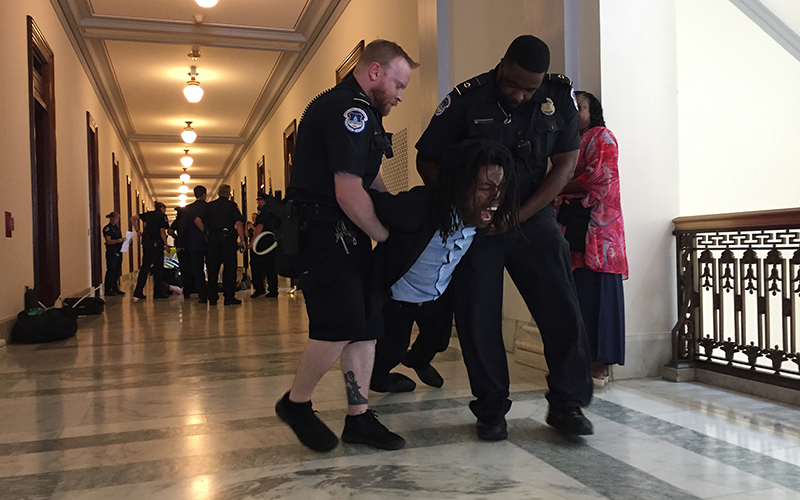 After 10 to 15 minutes, U.S. Capitol Police moved in and told the protesters that they would be arrested if they did not stop. They didn’t, and police cuffed and arrested a number of the protesters, who police said were charged with counts of crowding, obstructing or incommoding. 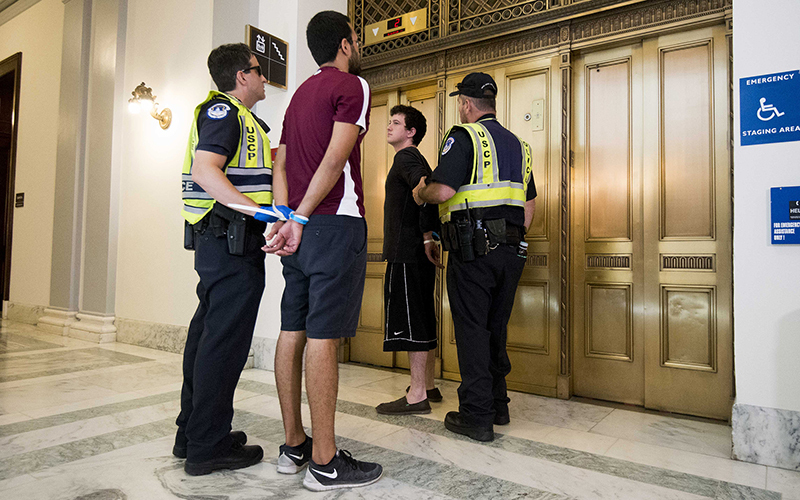 Capitol Police said they arrested 80 protesters in total, but did not provide a number for Arizonans who were arrested. LUCHA organizers estimated Monday evening that five to 10 of their group were arrested. Samantha Coronado was the first of the Arizona protesters to be lead out of the building by police, hands cuffed behind her back. They were protesting the Better Care Reconciliation Act, a Republican-crafted plan to replace the Affordable Care Act, or Obamacare. The GOP has said for years that Obamacare was driving up premiums and forcing people off health care. Critics like President Donald Trump often pointed to states like Arizona, where premiums rose 116 percent and numerous insurers pulled out of the state last year, after several years of rising coverage. But critics say the Senate bill, and a similar version passed by the House, would result in at least 22 million losing coverage over the next 10 years, with most of those losses coming in the first year. The Senate plan would reduce the federal deficit by $321 billion by 2026, according to the Congressional Budget Office, but would do so by cutting Medicaid funding and shifting more costs to states. She said she was lucky to be mobile enough now to come here and advocate for others like her, who could be severely affected but are not well enough to represent themselves. Klinkhamer, who spent years trying to get disability coverage, said she does not think she can go through that struggle again if she lost her coverage. “Multiple times I’ve wanted to die, like seriously worried about killing myself because I can’t do it again – I can’t,” Klinkhamer said, crying as she reflected on years of trying to get coverage.